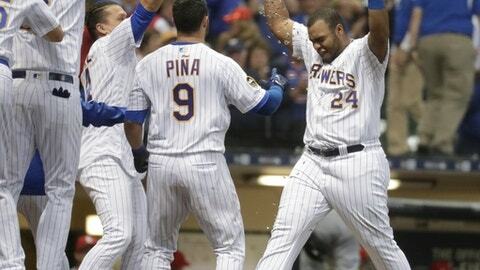 MILWAUKEE (AP) Neither Jesus Aguilar nor Bud Norris wanted to let their team down. Aguilar homered to break up rookie Jack Flaherty’s no-hit bid in the seventh inning, then homered again in the ninth to lift the Milwaukee Brewers over the St. Louis Cardinals 2-1 on Friday night. Both teams got just three hits. The benches and bullpens briefly cleared in the eighth after Eric Sogard slid into St. Louis shortstop Yairo Munoz, who caught a wide throw on a bunt play in the eighth. Norris (3-2) started the ninth for the Cardinals by striking out Travis Shaw. But, Aguilar followed with an opposite-field drive to right for his 16th home run. Norris, speaking in front of his locker in the subdued Cardinals clubhouse, owned up to the mistake. It was another tough loss for the Cardinals, who have lost nine of the last 12. Corey Knebel (1-0) pitched the ninth for the NL Central leaders. With one out in the seventh, Aguilar drove an 83 mph slider from Flaherty into the Brewers’ bullpen in left, where reliever Jeremy Jeffress caught the ball on the fly. A woman who was knitting – it appeared to be crochet, actually – in the front row behind home plate barely flinched as Aguilar connected. Aguilar tipped his cap to Flaherty. Flaherty matched a career high by striking out 13 in seven innings, allowing just one hit. The Cardinals played stellar defense behind him after giving up six unearned runs with a season-high four errors in Thursday’s 11-3 loss to Milwaukee. Munoz robbed Jonathan Villar of a base hit in the fifth with a nice running backhand stab of a liner tailing away from him. Matt Carpenter walked, advanced on a sacrifice by Harrison Bader and scored on Marcell Ozuna’s liner up the middle in the third. Brewers starter Junior Guerra allowed one run and three hits with four walks and seven strikeouts in five-plus innings. Cardinals: INF Paul DeJong (left hand fracture) took batting practice and is anxious to return. ”It looked like he didn’t miss a beat, but we’re going to have to slow down and make sure we’re following the program,” manager Mike Matheny said. Brewers: LF Ryan Braun missed his second consecutive game after receiving a cryotherapy injection in his troublesome right thumb Wednesday in Los Angeles. … LHP Wade Miley (right oblique strain) made a rehab start for Double-A Biloxi. He went two innings and allowed a run on three hits and struck out three. Each team struck out 15 times and each one seemed to bring consternation with plate umpire Tim Timmons. Tommy Pham, batting second, was ejected by Timmons after Pham took a called third strike in the first. He continued to bark about it from the dugout before being tossed for the first time in his career. Bader replaced Pham in center field. Cardinals: RHP Miles Mikolas (7-2, 2.69 ERA) makes his third start against the Brewers this season. He won 8-4 in his Cardinals debut on April 2. Brewers: RHP Chase Anderson (5-6, 4.54 ERA) makes his second start this season against the Cardinals. He is 2-2 with a 3.19 ERA in 10 career outings, including a no-decision April 3 at Miller Park.